1st Gear: What's 20 Million Cars Mean? You can complain all day about what the California Air Resource Board or Environmental Protection Agency are trying to do but, man, you don't want to be China right now. 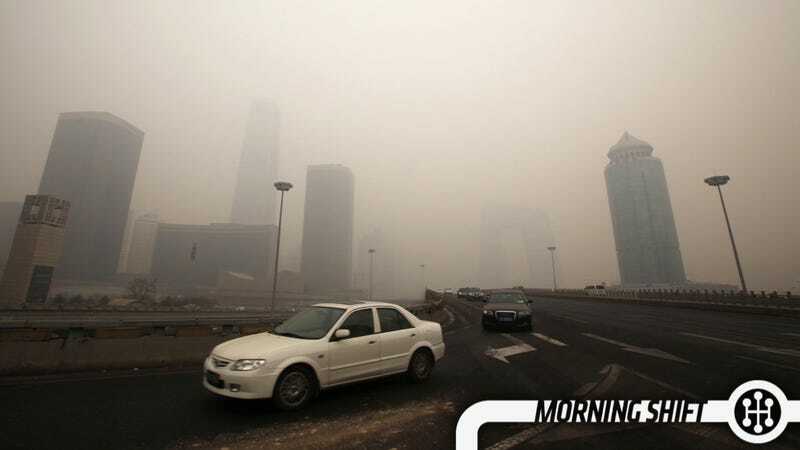 Bloomberg doesn't pull any punches this morning in their coverage of the Chinese market by contrasting the fact that the Chinese bought more than 20 million cars in 2013 (more than any country ever in a year) and also has cities where they are is so toxic they tell old people not to go outside. Total deliveries rose 14 percent to 21.98 million units last year and may exceed 24 million in 2014, the state-backed China Association of Automobile Manufacturers said today in Beijing. Last year's sales of passenger vehicles, excluding buses and commercial trucks, climbed to 17.93 million — or 15 percent more than the U.S. auto industry — and may increase 9 percent to 11 percent this year, it said. We may also, sometimes, complain about China exporting their plastic crap to us, but let's remember that we're basically exporting cars (the designs at least, and the the pollution they cause) to China and taking in big profits. German, Indian, American, Korean, and Japanese companies all sell lots of cars in China. As we pointed out last week, the sale of Fisker to one Chinese billionaire has been put on hold as Chinese parts company — and A123 Systems owner — Wanxiang Group has upped what they're willing to pay for the company by $10 million. We covered why Wanxiang might want the company, and certainly the gear above about massive pollution also makes it clear why, but what's in it for the sellers? If Richard Li/Hybrid Technologies buys Fisker then the unsecured creditors get a tiny amount of their money back, potentially, but Fisker will move out of purgatory and back into whatever life Li/Hybrid have for it. If Wanxiang buys it, or so the creditors think, they could be in line for getting at least half their money back, but it could put Fisker back in limbo for a while. Despite selling millions of cars outside of their own borders, the Japanese aren't keen on buying foreign cars that aren't expensive exotics or American vans from the '70s. American companies claim, fairly, that trade barriers and currency manipulation make it harder for them to compete in Japan compared to the relative ease with which Japanese companies can sell in the U.S. Despite all this, Ford of Japan is pushing the new Fiesta in the market at a price of $22,900. Will it be hit? Ford has struggled in Japan and stopped selling the Fiesta after selling just 2,800 of them from 2004 through 2007. The Fiesta is one of Ford's top-selling models, with more than 720,000 sold worldwide a year. Last year, Ford sold 3,500 vehicles in Japan, about half of them Explorer sport-utility vehicles. Even that number is a triumph for Ford, which has managed to increase Japan sales every year for the last four years. Baby steps, although I think they should totally sell the Raptor there as well. And GM should keep selling the old Astro van. Mexico is still booming as a production mecca in the Americas with their fourth year of record production and exports, spurred by the strength of the adjacent U.S. market. The Wall Street Journal says the industry reported production rose to 2.93 million cars and light trucks, up 1.7% from the year prior. Of those, they exported about 2.42 million. That makes Mexico the fourth largest auto exporter in the world, as only 1.06 million new cars were sold in the country and they imported about half of those. Back in the '70s the government mandated that dealers perform an inspection to make sure a car had proper emissions equipment and then give buyers a letter claiming that it does and what to do if that emissions equipment fails. While that was probably sensible policy back in the '70s, it was also sensible to wear a polyester leisure suit to a wedding. Times change, and no cars can leave the factory without all of their emissions equipment tested and checked. Thus, as Reuters reports, both Republicans and Democrats came together to unanimously vote to approve a bill that would repeal that requirement. Bipartisanship does happen, especially when encouraged by an all-powerful lobbying group like the NADA. On this day in 1965, the James Bond movie "Goldfinger," which features the suave British super-spy driving an Aston Martin Silver Birch DB5 sports car, opens in theaters across the U.S. Aston Martins would go on to appear in a number of other Bond films. Neutral: Car Sales At What Price? What should China do? Continue to restrict car ownership? Create stricter mileage standards? Nothing?